The longer, more accurate title is “The A to Z of things I’ve experienced, that I wouldn’t have experienced if it wasn’t for Crohn’s”. It is a fairly long post but it covers quite a range of topics. Anaesthetist – the last person you see before going into the operating theatre. The one that says “I’m just going to give you something to relax you”. Don’t believe them unless your definition of relaxation is being knocked out cold and waking up several hours later, or am I getting mixed up with a good night out in Croydon? The next time you wake up you could be in Recovery (or the Accident and Emergency Department of Mayday Hospital if it was a night out in Croydon). This may seem odd but I really look forward to the point at which you are about to be sedated. From that point onwards you are totally in the hands of others. There’s nothing you can to do that will influence the next few hours. You can let fate take over completely. You’ll go to sleep and hopefully, when you wake up, the reason you’re in this situation will have been resolved. On a more morbid note the anaesthetist could be the last person you will ever see so try and smile at them. Banding – the action of “killing off” or “obliterating” a varicose vein by tying it off with a rubber band. My veins (see Varices) are very inconveniently located towards the bottom end of my esophagus so require a specially adapted endoscope to place the bands. After the procedure you can only eat very sloppy food for 48 hours as you don’t want solids to dislodge the bands before they have taken effect. If you ignore this advice it hurts, I know. I did. I regret it. In late 2017 I underwent my 10th procedure. Bile Acid Malabsorption (BAM) – a much ignored condition and rarely discussed. All the fun of Crohn’s-like bathroom dashes but without the inflammation. I’m starting to wonder how many HCPs are aware of it all. According to NICE the vast majority of patients who have had their terminal ileum removed will suffer from it. In a nutshell your stomach digests food by dissolving it with bile acid. The mixture then passes into the small intestine and when it gets to the terminal ileum area the bile acid gets reabsorbed into the biliary system ready for the process to start again. If you’ve had the terminal ileum removed there is nowhere for the acid to be re-absorbed so it passes into the colon. The colon is not designed to cope with this level of acidity and its first reaction is “evacuate”, you can guess the rest. There are various medications available to counter the effects of BAM. I manage it with a combination of Colesevelam and Loperamide. Bile Bag – the name says it all. I first laid eyes on one when recovering from surgery in June 2011 and my digestive system had gone into lockdown (again). I was suffering from excruciating nausea which the surgeon said affected around 25% of patients undergoing colorectal surgery. The decision was taken to relieve the pressure and I ended up with a tube up my nose and down into my stomach. Whatever comes out needs to be collected and that’s where the bile bag comes into its own. Despite my scepticism it is indeed possible to push a needle, with a little effort, through bone. I even ended up having it done twice. It stings a little but as the haematologist said – “You’ve got Crohn’s, you’ve dealt with pain! This will be nothing by comparison”. Cannula – the plastic tube with a sharp point that gets introduced into a vein, usually in your arm, to allow the introduction of fluids such as saline solution or blood transfusions. I’ve lost count of how many I have had during the last 40 years. They’ve been administered by nurses, paramedics and junior doctors. The first two have always been fine but letting a junior doctor near you with a cannula is a big mistake. I appreciate that they have to learn somewhere but I’d rather not be the guinea pig. I even asked the last doctor, who attempted cannularisation, if he was experienced in the procedure and he assured me that he was. Within an hour I had to have a new one inserted by a nurse. By preference the cannula should be sited somewhere that will allow you to eat, write, use a phone and go to the toilet without too much inconvenience. 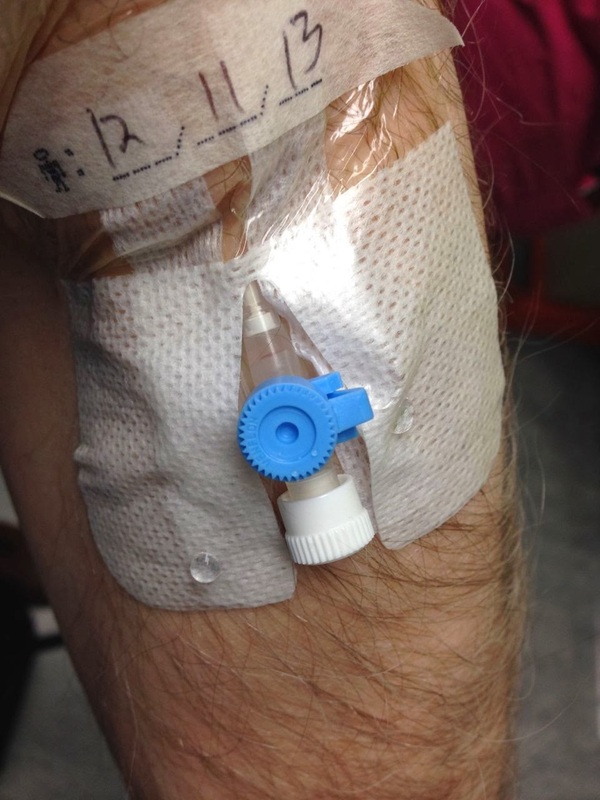 The first law of cannularisation – “all cannulas must be photographed and posted on SoMe”. Other patients will find this fascinating. Catheter – not to be confused with the cannula described above. A catheter is a thin tube with a blunt end and can be inserted into an existing orifice or through a cannula. My first experience with a catheter was in preparation for being fed intravenously (known as a PICC line). The catheter entered at my wrist, travelled up my arm, inside a vein, and over my shoulder into my chest. Just seeing the apparatus would be enough to make some patients faint. I like to think that I’m made of sterner stuff so the sight of a thin plastic tube, 800mm long, and knowing where it was due to go, was more a curiosity than a worry. The installation process however did not go smoothly. The first attempt at insertion failed so the doctor tried the other arm. Still no luck. Go back to the original arm. Nope. By now I was surrounded by an ever growing gaggle of doctors and nurses making helpful suggestions Finally, at the fifth attempt, the tube was in postion and the feeding solution connected. Colonoscopy – sticking a camera where the sun don’t shine. As with many procedures I find the thought of what is going to happen is often worse than the actual experience. I can tolerate the procedure quite well but it’s the 24 hour fasting beforehand that I struggle with. I like to keep awake during the procedure as you get to see exactly what the consultant is seeing and if you have any questions they can be asked there and then. You find out what’s happening inside your gut in real time and don’t have to rely on being told after you wake up or at your next appointment. For my last colonoscopy I had the added bonus of an audience of international trainee gastroenterologists watching the proceedings from the room next door, via video link, whilst my gastro consultant gave a running commentary and his colleague drove the camera ever onwards. Dexamethasone – a steroid – the work of the devil. Dexamethasone is the steroid’s steroid. About 5 times as powerful as prednisolone for the same tablet dose. It had been found that in some patients a short, sharp course of this drug could dramatically improve platelet count. I was about to have a liver biopsy and my platelets were very low so was given a dose of 40mg for 4 days. All was well for the first 3 days and then I started to get hiccups and an uncontrollable appetite but on day 4 I started acting as if I had a form of Tourettes. Very odd. I mentioned to my haematologist that I had become “loud and obnoxious” but she refused to write that down in my notes as she said she would be struck off. Enhanced Recovery Programme – I had my ileostomy at St.Thomas’ Hospital in London and, being elective surgery, was given the choice of participating in their Enhanced Recovery Programme. I could have opted out but grabbed the opportunity with both hands. The pre-operative assessment, planning and preparation before admission mean that you are given comprehensive information on what will happen, when it will happen and the likely outcomes. Instead of going into hospital unprepared you already have a good idea of what to expect. I found it helped me to become very calm about the whole situation. As part of the early mobilisation you are expected to drink fluids as soon as you come round in Recovery and then to be eating solids within 24 hours. A far cry from the 3 weeks “nil by mouth” that I had been through 30 years previously. Fistula – which I thought sounded like some unsavoury fetish but when I was told I had one checked the definition – “an abnormal connection between two structures”. Luckily(?) mine was internal, between sections of intestine, so any leaking was kept inside but they can run from inside to outside the body and prove difficult to heal. Flexible Sigmoidoscopy – Colonoscopy Lite. 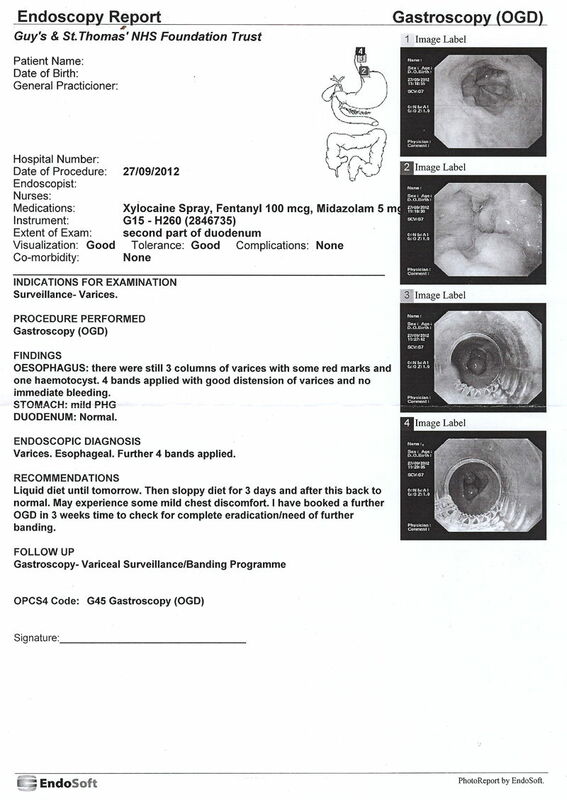 Before having surgery in 2010 the surgeon wanted to check the condition of the lower part of my colon. He carried out this procedure so he knew what to expect once he wielded the scalpel. The scope used for a flexible sigmoidoscopy looked to be a much shorter instrument and only goes as far as the left side of the colon (which I guess means up to the sharp bend before the colon travels across the body). The test requires different preparation and sedation. Gaviscon substitute – a disgusting, aniseed flavoured pink sludge. As part of the attempts to clear the nausea following my reversal operation I was given a small container of Gaviscon substitute to drink. The smell alone was enough to trigger a reaction but I gulped the whole lot down and within seconds…..well I won’t go into the details but suffice to say I felt a lot emptier afterwards and the pressure on my stomach was suddenly bearable. It’s said that the most powerful of the five senses for triggering memories is the sense of smell. I am dreading ever coming into contact with anything that smells like it again as I’m sure my instant reaction will not be very pleasant for either myself or anyone within a two metre radius. Knowledge – the ability of the patient to gain knowledge about their condition(s) has grown immeasurably over the last 20 or so years. Firstly – generic. Information on Crohn’s, treatments, etc. The internet provides an information overload and it takes some skill to be able to sift out the good stuff. Secondly – specific. In the UK, for a fee(s), you can request a copy of your complete medical records from your current or previous Health Authorities. The forms are available on line and the Authority has 4 weeks to comply with your request. I have found this has greatly improved my understanding of how my own health has progressed/declined. Loperamide – or Imodium as it is better known. I first took Imodium in 1978 to try and control the big D with little effect. I took it again in 1979 and after 2 weeks ended up in hospital with a perforated bowel. For many years I blamed this on the prolonged use of Imodium. Fast forward to 2010. After the ileostomy my digestive system would not regulate itself and I was in danger of not being allowed home. The surgeon put me on Loperamide “as required, up to 12 capsules a day”. I asked him if it was OK to take it long term and he said “Yes”. Since then I’ve been on 2 tablets a day so have revised my original theory on the cause of the problem in 1979. Metronidazole – an anti-infection drug that has been found to be beneficial after surgery. I was put on it for 3 months after my reversal. There was one major side effect – my taste buds were shot. It certainly worked on the anti-infection front but I couldn’t wait to stop taking it and to be able to taste food properly again. Naso-gastric Tube – the bit that feeds the aforementioned bile bag. I can put up with most things in hospital but having a tube up your nose, down your throat and into your stomach has to rank pretty high on the “barely acceptable” scale. Probably the only thing higher on the list is nausea and since the tube was there to relieve the nausea it really was JUST the lesser of two evils. Orabase – gloopy polyfilla for stomas. My stoma had started to become uncomfortable, or rather the area under the backing plate on the pouch was painful. From above all looked OK and I didn’t think to use a mirror to get an all round view. What did make me sit up and take notice was the pouch (bag) filling with bright red blood one evening. First thought – internal bleeding. Second thought – ring for ambulance. The cause – an abscess immediately below the stoma which had burst but had bled into the pouch. I was patched up and sent home with instructions to see the stoma nurse the next day. She was completely unphased by the situation (but then stoma nurses are always unphased or they wouldn’t do the job they do). I jokingly said to her that what we needed was some polyfilla to fill the depression caused by the abscess and she produced a tube of Orabase. Problem solved and it never returned. Pharmacy – the final frontier. The hurdle between hospital and going home. The one thing that stops you leaving at the time you planned. The Ward Sister utters that sentence of doom “you just have to wait for pharmacy to deliver your tablets and then you can go.” I have waited 5 hours on one occasion and there is nothing that can be done to speed them up. Guaranteed to bring on unnecessary stress (and under-the-breath swearing). For inpatients there is a way around the situation. Make friends with the pharmacist on their daily ward round and once you know when you are due to be leaving hospital ask them if they can have your tablets locked away in your bedside cabinet ready for discharge. I’ve tried this twice, and it works. Primary Sclerosing Cholangitis (PSC) – a mouthful to say; an earful to hear; and a brainful to comprehend. I had been sitting in one of our local hospital beds for a few days, undergoing various tests and wondering what new complaint I was suffering with. It was a consultant doing his ward round who first mentioned Primary Sclerosing Cholangitis and then liver transplant in the same breath. There was no way I could take it all in so a little later I called over one of the junior doctors and asked her what the long named disease was so that I could look it up on the internet. She spelt it out but suggested I might want to refrain from looking it up at present. That was reassuring! Questions – never to be afraid to ask questions of nurses, doctors, consultants, radiographers etc. Take the opportunity to build your knowledge of your condition. My three years were up in June 2014 and I’ve now reached seven. SAL – Surgical Admissions Lounge – I assumed that the night before my reversal operation I would be taken onto the Ward where I would go for recovery and they prepared you for surgery. Reversal is clearly not considered major surgery so the instructions were to report to the SAL at 7:00am on the morning of the op. It was all very “matter of fact” and probably contributed to my remaining calm throughout the wait to be called. SeHCAT – or to give it is full name is 23-Seleno-25-Homo-tauro-Cholic Acid Test, which you probably realise is a taurine-conjugated bile acid analog. It tests for bile acid malabsorption and is one of the simplest from a patient’s point of view. You swallow a radioactive pill then wait an hour and get x-rayed. Repeat the x-ray one week later and compare the two levels. The difference shows how much has been reabsorbed and therefore how much has passed out of the system or has been “malabsorbed”. For a normal person the value is >15%. Unfortunately I was just 1%. St.Thomas’ Hospital – one of the leading London hospitals. Situated on the South Bank of the Thames, adjacent to Westminster Bridge and immediately opposite The Houses of Parliament. 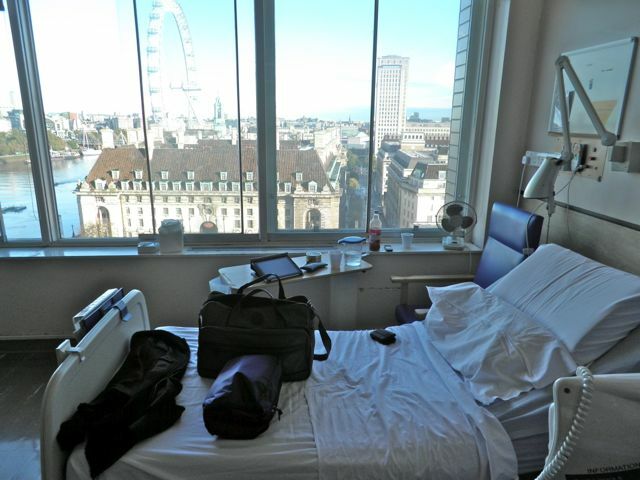 The colorectal ward is on the 11th floor and the view is truly spectacular. It must help with your recovery as there is always something to see and take your mind off of your current situation. I didn’t expect to end up in St.Thomas’ but my local hospital said that they simply didn’t have the recovery facilities that would be needed after such a major piece of surgery. I’m so glad that they referred me. The inconvenience of getting up to London has beenfar outweighed by the excellence of the facilities and care that I have experienced. Stoma – from the Greek for mouth and means an opening, either natural or surgically created. Operations involving the creation of an opening are suffixed -ostomy; the prefix describes where the opening is. My 2010 operation was an ileostomy ie. opening formed in the final section of the small intestine. I actually had two stomas – the one at the end of the small intestine and the other at the end of the temporarily redundant large intestine. The use of a word meaning “mouth” to describe the opening seemed rather apt as I suffered a prolapse of the lower stoma and as a result it looked like Mick Jagger was trying to escape from my abdomen. My “Alien” moment. Thrombocytopenia – the long name for low platelets. There are several theories as to why my platelet count is so low. These range from long term use of Azathioprine; to an enlarged spleen; to “you’ve got bigger than normal platelets so you don’t need as many”. The science of haematology does seem to be a little “vague”. Upper GI Endoscopy – sticking a camera where most of the crap comes out of ie. through the mouth. I really don’t like this procedure. I really don’t like the anaesthetic spray they use to numb the back of the throat (it tastes of burnt bananas) and I really don’t like the gag (mouthpiece) that goes between your teeth to guide the camera. Just once I had it done without full sedation. Never again. Nowadays I always ask to be put completely under, even though the recovery time is a couple of hours longer and I have to find someone to accompany me on the journey home. Varices – varicose veins, but in my case not just any varicose veins. These ones have developed in the linings of my lower esophagus and upper stomach. How did mine get there? The explanation is too long (and boring) for this post. The way they announced themselves is much more interesting and fairly unpleasant. It involved bringing up a large amount of congealed blood (which resembled redcurrant jelly) and then being rushed to hospital, with sirens, once the initial shock of the situation had passed and I had managed to call out for help. I Googled varices and banding, and immediately wished I hadn’t. The first page said that 70% of those who have a variceal bleed will have it happen again and for a third of those it will be fatal. If I’ve got the maths right that’s 70% x 33% = 23%, so for almost a quarter of patients suffering variceal bleeding it will prove fatal. I think you can see why Google and all that information now readily available on the web is a bit of a double edged sword. Ward Round – the chance for the lead consultant to practice their acting skills and have a go at playing Sir Lancelot Spratt (character from the British classic film – “Doctor at Large” – it’s on YouTube – see below). They sweep into the ward surrounded by a gaggle of junior doctors and students. The bigger the group the better the opportunity to “shine”. I find ward rounds very informative. You can usually learn a few things that you either haven’t asked or nobody has thought it necessary to tell you. It’s also interesting to compare the approaches of the different consultants and their explanations as to what is wrong with you, what they’ve done to you and what they are going to do to you, if you survive. I’m far too old and crabby to be intimidated by the assembled crowd of eager, and not so eager, faces so I always make sure that I provide a foil to the consultant’s leading role. Sometimes you really can’t wait for the round to begin. This has usually been preceded by a test for which you desperately want to know the results of or someone has said the magic words “You can go home when the consultant is happy with you”. The worst thing you can do is go off for a shower only to find that when you return to your bed the Consultant, and attendant gaggle, has already passed though and will not be back until the next day. To avoid this happening you can either shower very quickly, being careful not to fall over, but it’s probably best to stay put in the ward until you’ve been seen. Xylocaine Spray – the taste of burnt bananas in an easy to administer spray. If you’ve had an upper GI endoscopy you’ll recognise this taste. The spray deadens the back of the throat so that you don’t feel the camera passing through. I’m finding that just thinking about the spray, and the mouth gag that follows shortly afterwards, is making me feel sick so that’s enough for now…. Y and Z – no interesting terms come to mind for these letters at present. I’ll leave them as “work in progress” but I’m open to suggestions.